We love wine and do know quite a bit about it. The thing is, wine is very complex and has a rich, very interesting history. That being said, there are some fun facts about wine that can get you more associated with your favorite beverage. 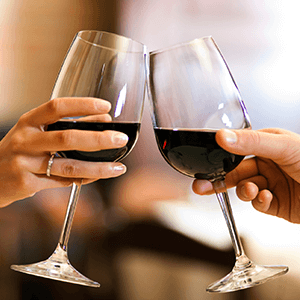 Bumping glasses with a “cheers” came from old Rome. This was used as a method to make sure no one was trying to poison each other. The Bumping of glasses makes the drinks spill into each other. Don’t keep your bottles standing up, this can cause the cork to dry. When the cork dries, it can shrink allowing oxygen to get into the bottle and spoiling the wine. Always keep bottles lying down unless it is an artificial cork. People commonly keep wine in the kitchen, but it can be the worst place for it. Kitchens are typically too hot, and refrigerators are typically too cold. They are best kept in a cool dark place, such as a pantry. Is it wine gets better with age or age gets better than wine? Well, it is actual a misconception that all wines improve with age. In fact, more than 90 percent of all wines should be consumed within one year. There is a difference between an aroma and a bouquet. When someone refers to the aroma of a wine, they are speaking about the scent of the grapes. When wine tasters describe the bouquet, they are referring to the post-fermentation process and how the wine has developed. In the Middle Ages, monks particularly apt winemakers, and they are said to have tasted the earth to discover how the soil changed from place to place. It is thanks to their research and indefatigable efforts we have such an elaborate winemaking technology today. Just because it doesn’t have a cork, doesn’t mean it is cheap. Today screw caps are replacing corks on more than just inexpensive bottles. They not only help seal the wine but prevent spoilage due to wines reactions to cork. Currently, screw caps seal 75 percent of Australian wines and 93 percent of New Zealand wines, and they’re gaining popularity in all countries, including here in the U.S. It is traditionally believed that if you smell the cork it reveals more about the wine. While the cork does tell you something about the wine, it doesn’t have to do with smell. Instead, if you are handed the cork, you should look for the date and other identifying information. Additionally, look for mold, drying, cracking, or breaks in the cork. If you have any questions or are looking for suggestions for wines, come into Festival Wine and Spirits in Annapolis. Our knowledgeable staff is here to help. Also, make sure you check out our weekly specials, might just find something perfect for your wine night!